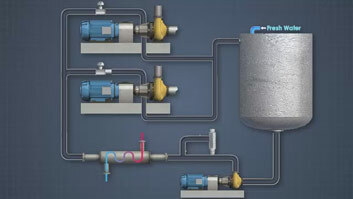 The conventional chilled-water system consists of a water chller, load terminals, cooling towers, chilled water pumps, and a chilled water and cooling water distribution system. 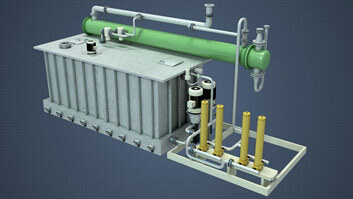 Efficient removal of heat is a requirement in designing and operating a cooling system. Heat transfer takes place because of the difference in temperature between two media. 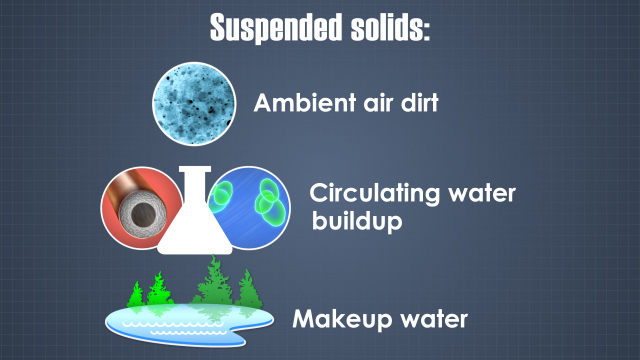 Suspended solids originate from three primary sources: ambient air dirt, circulating water buildup from scale, treatment chemicals and algae , and makeup water. When equipment runs, it generates heat. Overheating can lead to equipment malfunctions and possible downtime. In order to prevent this, cooling and chilled water systems are set up to continually remove heat from the components to keep them within a desired temperature range. This course describes the design of cooling and chilled water systems as well as the principles of operation for both chilled and cooling water systems. 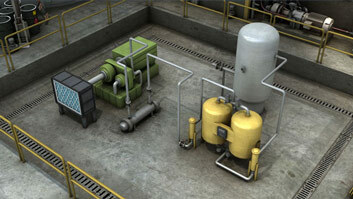 What are two major types of cooling water systems? Cooling water systems are either nonevaporative or evaporative. What are two major types of nonevaporative cooling systems? 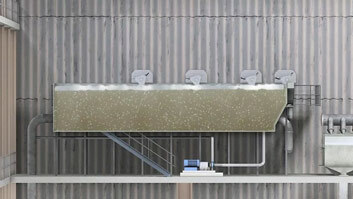 Nonevaporative systems include once-through cooling and closed loop systems. 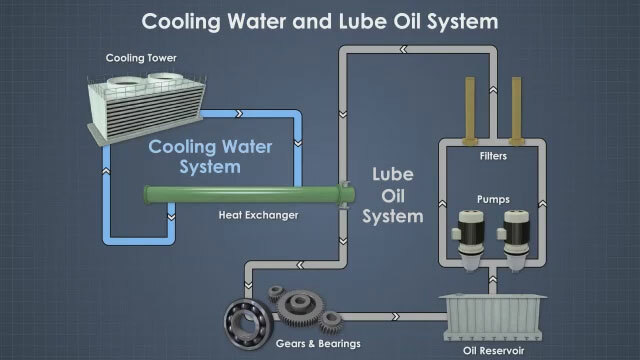 What is a once-through cooling system? 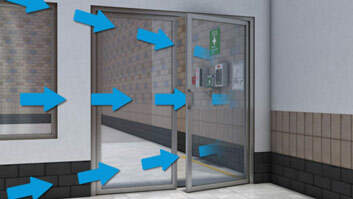 Once-through cooling uses the cooling fluid only once to cool processes before being discharged from the system. 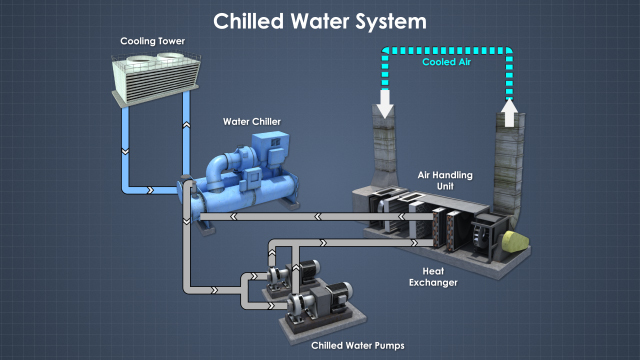 What is a closed cooling water system? A closed cooling water system is a recirculating water system that requires a secondary cooling system and heat exchangers. What are evaporative cooling systems? Evaporative cooling systems are open recirculating systems in which heat rejection is accomplished in cooling towers, spray ponds, or cooling lakes. When equipment runs, it generates heat. Overheating can lead to equipment malfunctions and possible downtime. In order to prevent this, cooling and chilled water systems are set up to continually remove heat from the components to keep them within a desired temperature range. 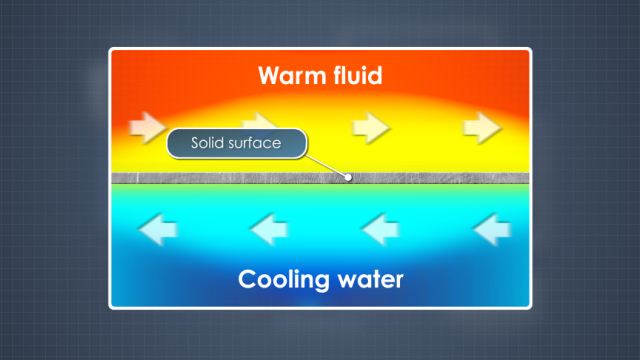 Water cooling is a method of heat removal that uses water as a medium to transfer heat. In other words, cooling water controls temperature by transferring heat from the equipment to the cooling water. Once the water has been heated, it must be cooled again, or be replaced by a fresh supply of cool water.